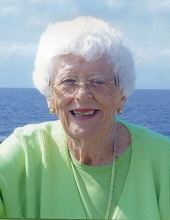 On Sunday, March 31, Mrs. Margaret 'Jean' Wright of Vermilion passed away at Harvest Home, Vermilion Long Term Care at the age of 96 years. A Funeral Service for Jean will be held on Saturday, April 6, 2019 at First United Church, Vermilion at 2:00 p.m. If so desired memorial contributions in memory of Jean may be made to First United Church, Vermilion Public Library or the charity of your choice. "Email Address" would like to share the life celebration of Margaret Jean Wright. Click on the "link" to go to share a favorite memory or leave a condolence message for the family.